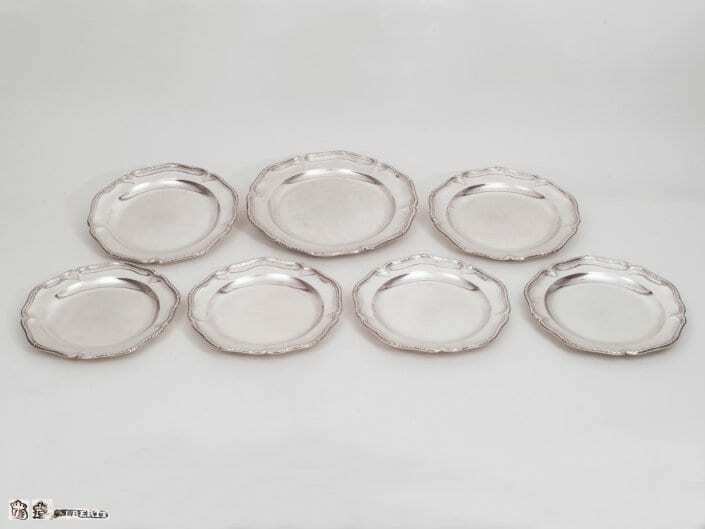 Antique silver plates can be used as serving or dinner plates. Very often, plates are decorated with a coat of arms (from earlier proprietors) or with monograms. In their actual form – with a deep well in the middle – plates have been used in Europe since the sixteenth century, originally only by aristocrats. 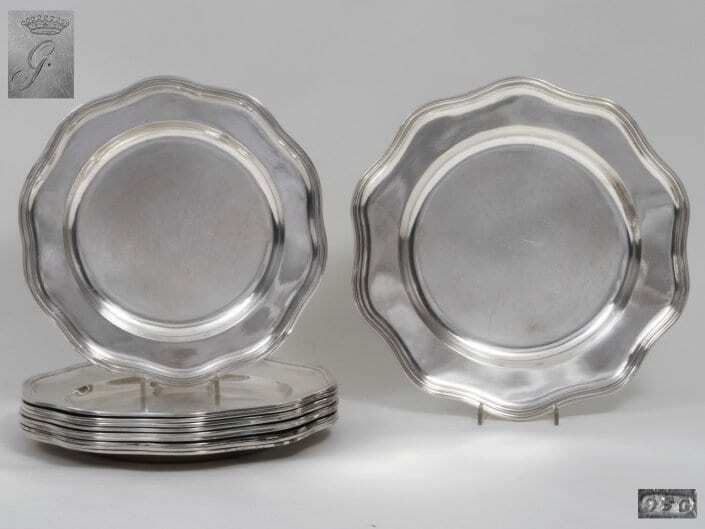 Later, silver plates became an important part of the dinner service of private and upscale households. 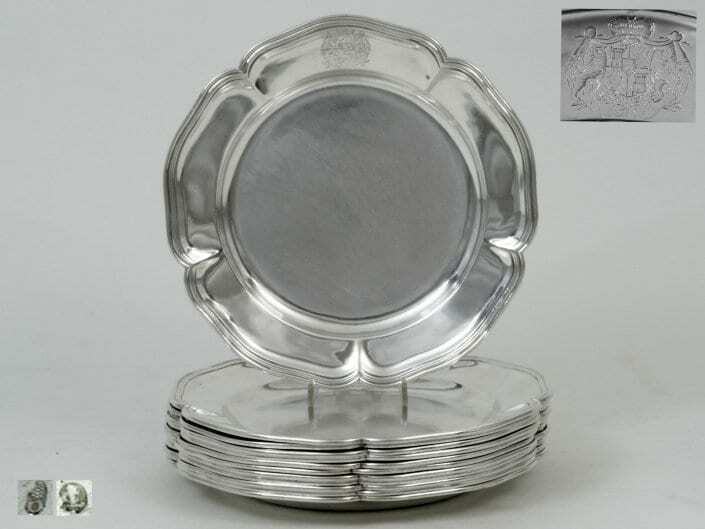 Twelve silver dinner plates from the Thurn and Taxis House. The plate has the form of flower pedals and this make its one of them to look unique. From the property of Thurn and Taxis. Made in Augsburg by Johann Conrad Lotter. 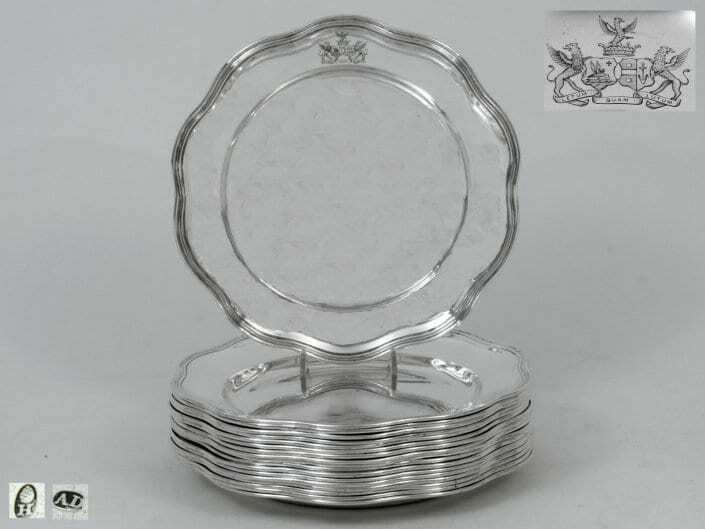 Set of eighteen silver dinner-plates made in Augsburg, mid-eighteenth century. 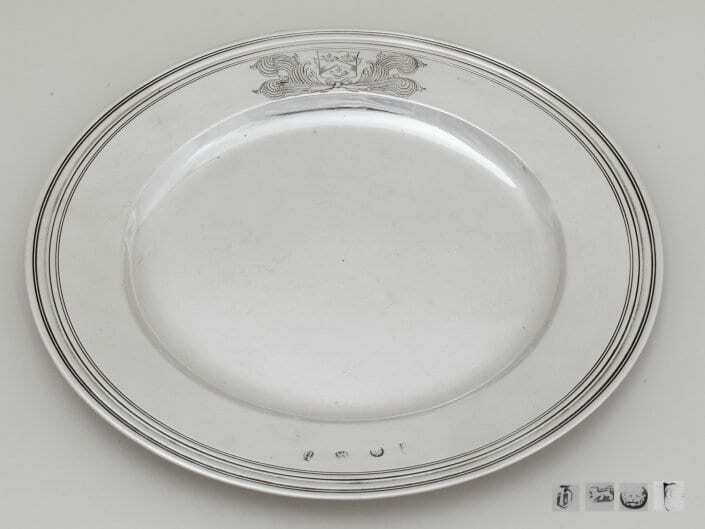 The only decoration on the smooth plate is the ten Passignano, curved, profiled roseleaf edge, with an ornately engraved coat of arms for Pierre-Alfred de Bardon, Marquis de Segonzac from France, and his wife Erlanger from the family of an Austrian baron. The lips of the silver plates are flat, curved and adorned with a raised laurel band. On the underside: engraved coat of arms of the House of Savoy, marks. Augsburg 1802-3, Gustav Friedrich Gerich. 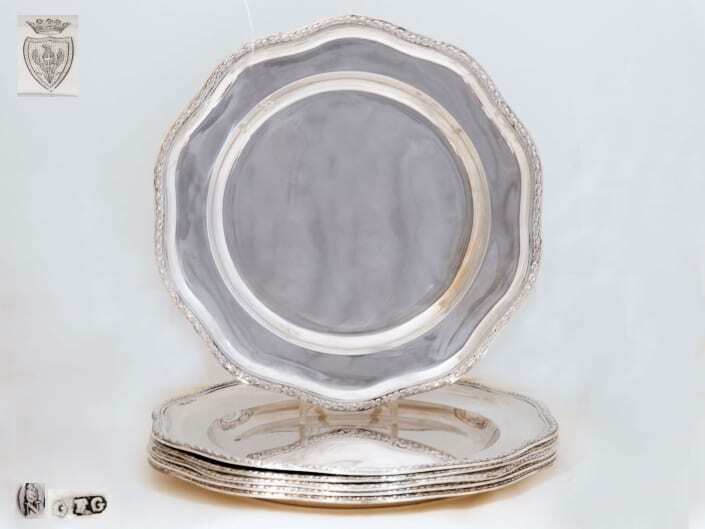 The present set of seven, silver dinner plates consists of a large plate with six arches, and two medium size ones. The four small ones have five arches. The present set of ten dinner plates and a serving platter was made in Augsburg at the beginning of the nineteenth century. Set of six French silver-gilt dinner plates. 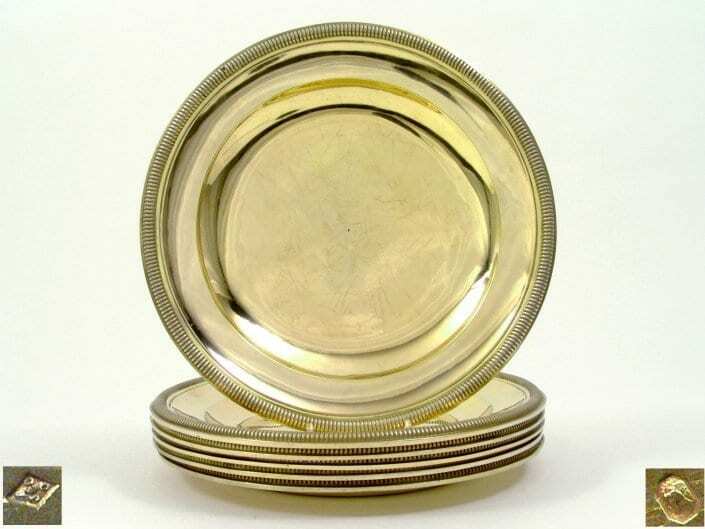 The round plates are worked solidly and very elegant. Made in Paris at the beginning of the nineteenth-century by Jean-Baptiste Claude Odiot. The present round, antique silver plate is an excellent object of English silver of the late 17th century. Very strict and timeless, minimalistic design.